My family has required the support of Personal Support Workers more than once over than once in the last few years. We, as a community have high expectations of these individuals. They must go from house to house, apartment to apartment, to provide personal care. Let's stress the word PERSONAL. That means requiring to learn the needs of the individual, including help them to dress, go to the toilet, bathe; empty commodes, preparing meals, doing laundry, house keeping, shopping, and running from one client's residence to another when someone is in crisis. It even includes cleaning the mess of feces and urine which has run down someone's legs the week after they have had chemo therapy. AND WHAT DO THEY GET PAID in exchange for this extremely personal, hard labor? Only MINIMUM WAGE or very close to it. How can we expect someone to live in Northern Ontario, drive their own vehicle from one end of the city to another, and pay them minimum wage? Do you really think you can hire someone from Jamaica, Peru, or Mexico and have them set up residence to work for minimum wage? We have an aging population, which is an issue our governments have know was going to happen for years. 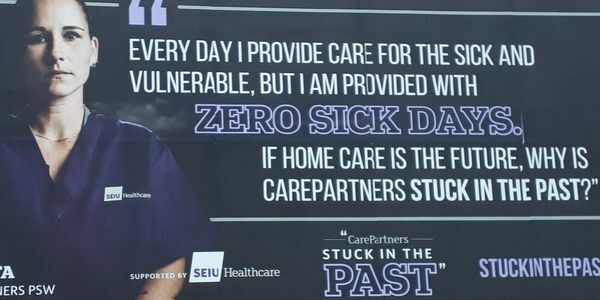 People who worked, raised their families, and paid taxes are now unable to get the medical care they require, unable to be provided nursing home care, and can not afford retirement residence living. Out of necessity, they must stay in their homes and be provided community support. It is not that there are not enough loving, kind, compassionate individuals in this community to hire. It's just that they don't want to be treated like slaves and not be fairly compensated for what they do. They quit because they just cannot find value in the conditions they work under. Provide a fair wage and reasonable work conditions to the people who fill these desperately needed services for our loved ones and people will come to work. Don't bring some naive person from another country to treat them as a slave in Canada. That way abolished long ago. We must treat people with dignity, respect, and fairness. Tell MPP Ross Romano to support a fair wage and better working conditions for personal support workers!